This shed is a perfect combination between environmental stewardship and space. It is exactly 8 feet by 8 feet by 8 feet so a very small amount of waste results from construction of this shed. (All dimensional lumber is sold in 2 foot lengths and and plywood is sold in 4 by 8 sheets) It has many features: architectural shingle roof, exterior grade door, window, door trim, battens, trusses and more. This shed is insulated and heated for year round use. It can be used as a heated studio, hobby workshop, office, or storage. It can be built on skids, concrete piers, or a slab on grade foundation. 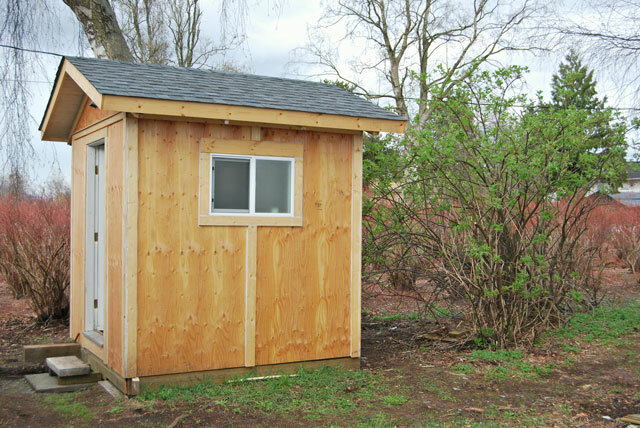 As this shed is below 100 sq feet it does not require a building permit in most cities in the lower mainland, however the location of a shed in a yard still must comply to local zoning bylaws.